There is a big difference between wines from the Right Bank and Left Bank, or should I say, there are several important distinctions between Bordeaux wines from the Left Bank and Bordeaux from the Right Bank. The terroir and soil are different. The percentages of grapes planted are not the same. The culture of each region differs and because each area has its own unique style and character, as you might expect, the wines are quite different as well. The wines from each area taste, smell, feel and age differently. And that is just to get things started. So, as you can see, there are very important differences between wines from the Left Bank of Bordeaux, when compared with wines from the Right Bank of Bordeaux. But for now, let’s start with the wines, vineyards and chateau located in the Left Bank of Bordeaux. 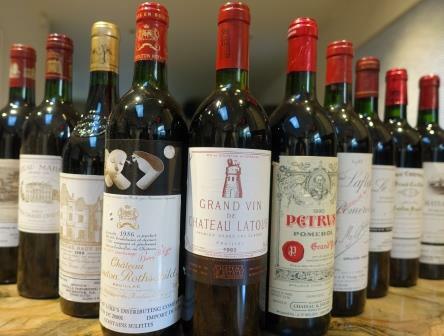 The Left Bank consists of wines from the following major appellations; Margaux St. Julien Pauillac St. Estephe, Haut Medoc and Pessac Leognan appellations. In total, in the Left Bank of Bordeaux, the best wines come from eight different appellations or communes located primarily in what is often referred to as the Medoc. The Left Bank of Bordeaux is the home to all of the official 1855 Classified Bordeaux wines. The Medoc also includes the Haut Medoc, Moulis, Medoc and Listrac appellations. In total, there are 13,727 hectares planted with vines in the Medoc. Looking on a map, the Medoc starts just north of the city of Bordeaux and extends north, past St. Estephe to the Le Verdon port. However, many people also consider the Left Bank to include the wines of Pessac Leognan, which adds an additional 1,199 hectares under vine bring the total amount of hectares under vine to 14,926! The Left Bank is where you will find all the First Growth Bordeaux, as well as all the other 1855 Classified Bordeaux wines of the Medoc including the Second Growths, Third Growths, Fourth Growths and Fifth Growths. In the Left Bank of Bordeaux, more than 200 chateaux can be found that are classified as Cru Bourgeois. The Left Bank is also the home of all the Cru Bourgeois estates. While most of the Cru Bourgeois are located in Haut Medoc, others are situated all over the area from as far north as slightly above St. Estephe to below Margaux in the south as well. You can also find more than 40 chateaux classed as Artisan Crus, cooperatives and a countless array of small, unknown growers in the Left Bank of Bordeaux. While all the wines from the Left Bank of Bordeaux are blends, in the Medoc, Cabernet Sauvignon is the dominant grape, followed by Merlot and Cabernet Franc. To a lesser degree, Petit Verdot, Malbec and small amounts of Carmenere are also planted in the Left Bank of Bordeaux. While the vast majority of wines produced in the Medoc are red Bordeaux wine, there are a few producers that also make white Bordeaux wine, most notably Chateau Margaux. However, the best white Bordeaux wines are produced in the Pessac Leognan appellation. With the exception of Chateau Haut Brion, all the chateaux that earned their place in the 1855 Classification are located in the Medoc, which is the heart and soul of the Left Bank of Bordeaux. Aside from the grapes and the styles of the wines found in the Left Bank of Bordeaux, when it comes to culture, the biggest difference between chateaux in the Right Bank, vs. chateaux in the Left Bank is the famous, 1855 Classification. The classification included 61 different chateaux, ranking them in order from First Growth, Second Growth, Third Growth, Fourth Growth and Fifth Growth. When the classification of 1855 was initially created, it was not intended to be a fixed document that would continue for centuries. But that is exactly what happened. The classification of the Medoc took place in 1855. Chateau included in the classification all came from the top appellations in the Left Bank, Margaux, Saint Julien, Pauillac, Saint Estephe and of course Chateau Haut Brion, from Pessac Leognan. The first classification of Left Bank Bordeaux producers classed as Cru Bourgeois took place in 1932. Pessac Leognan has its own classification, which was finalized in 1959. While there are vintages that clearly favor Left bank Bordeaux wines. It is not that simple. For example, there are years when St. Estephe performs great, while other appellations have difficulties, which is what happened in 2003. With that in mind, and knowing these are very general tips on the best years for Left Bank wines, you should look for 2017, 2016, 2015, 2014, 2010, 2009, 2008, 2006, 2005, 2003, 2001, 2000, 1996, 1990, 1989, 1986, 1985, 1982, 1978, 1970, 1966, 1961, 1959, 1955, 1953, 1949, 1948 and 1945. While Pomerol and Saint Emilion together have roughly 6,369 hectares planted with grape vines, the entire area known as the Right Bank is much larger and more diverse, when you consider the important, satellite appellations. We also cover the main grape varieties grown in the Right Bank. While all Bordeaux wines are blends, Merlot and Cabernet Franc are the dominant grape varieties, in the Right Bank. Although you will find some growers also plant Cabernet Sauvignon, Malbec and Petit Verdot as well. This unique combination of soil types and grape varieties are a large part of what has helped make the wines from Right Bank of Bordeaux so famous, as well as sought after all over the world. 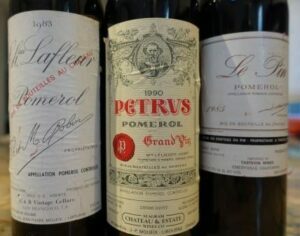 This includes the best Right Bank Bordeaux wine producers from the most important Bordeaux wine producing appellations of the Right Bank: Pomerol and Saint Emilion. We also cover the best Value Bordeaux wine producers and the top chateaux located in best regions known for producing Bordeaux value wine, Bordeaux Superieur, Cotes de Bordeaux, Cotes de Castillon, Cotes de Francs, Fronsac Canon Fronsac, Lalande de Pomerol, and the various St. Emilion Satellite Appellations, Montagne St. Georges St. Emilion, Lussac St. Emilion and Pusseguin St. Emilion and the Cotes de Bourg. The Right Bank looks and feels differently than the Left Bank starting with the vineyards and the majority of the actual chateaux that are in the region. In the Left Bank, you find numerous large, if not massive estates and vineyards that can be over 100 hectares in size. That is not the case with Right Bank vineyards, which are often closer to an average of 5 hectares in size. There are a few, stunning, massive, architecturally, stunning chateau in the Right Bank, but generally speaking, you find more family homes and smaller, classic chateaux here.